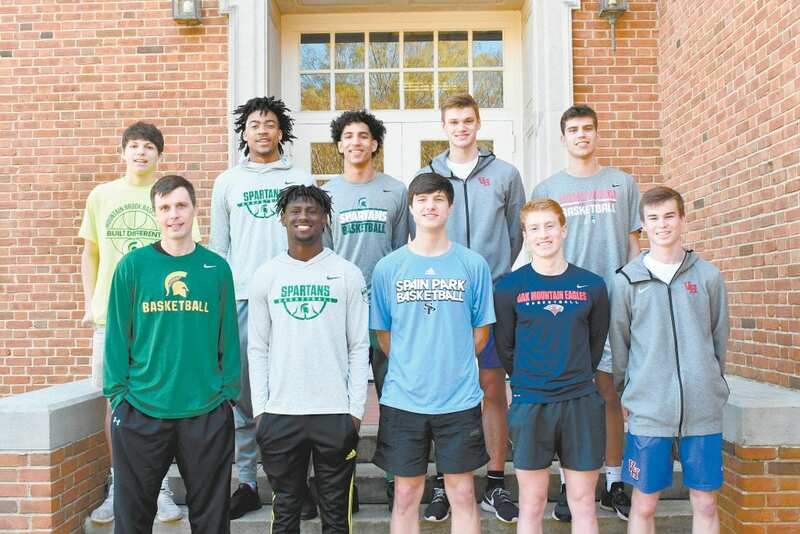 Members of the 2018-19 All-Over the Mountain Boys’ Basketball Team, front, from left: Coach of the Year Bucky McMillan, Mountain Brook; Alex Washington, Mountain Brook; Austin Laatsch, Spain Park; Drew Dunn, Oak Mountain; and Luke Couch, Vestavia. Back: Lior Berman, Mountain Brook; Trendon Watford, Mountain Brook; Colby Jones, Mountain Brook; Paul Michael Hargrove, Vestavia; and Logan Padgett, Homewood. Not pictured: Ahman Ellington, Hoover; and CJ Melton, Hoover. Trendon Watford doesn’t receive an award every day. It just seems that way for Mountain Brook’s celebrated 6-foot-9 senior forward. Last week, Watford was named the Gatorade Alabama Boys Basketball Player of the Year for the second consecutive year. That came on the heels of him being named to the Alabama Sports Writers Association All-State team after he was the most valuable player in the Class 7A state tournament while leading the Spartans to their third consecutive championship. And that came a few weeks after he was named a McDonald’s All-American, the first player from the Birmingham area to receive that acclaim since Buck Johnson in 1982. And he’s the prohibitive favorite to win the Alabama Mr. Basketball award for the second consecutive year and the Class 7A Player of the Year for the third consecutive year when those awards are announced March 26 in Montgomery at the annual ASWA Player of the Year banquet. So, it’s little wonder that the Over the Mountain coaches selected Watford Over the Mountain Boys Basketball Player of the Year. With so many awards, you would think Watford would give the honors the ho-hum treatment. But you would be wrong. “They mean a lot to me because I can’t take anything for granted,” Watford said. Watford averaged 23.7 points, 11.2 rebounds, 4.1 assists, 3.1 blocks and 2.5 steals per game while leading Mountain Brook to its third consecutive title and a 31-3 record this season. He had 22 points and 11 rebounds in the Spartans’ 61-42 rout of Baker in the championship game. Watford has been playing varsity since he was in the eighth grade at Shades Valley High School. He transferred to Mountain Brook as a freshman and starred for the Spartans for four years. It was during his freshman season that Watford felt the painful agony of defeat when Mountain Brook lost to Hoover in the Class 7A championship game, denying the Spartans a three-peat that season. The disheartening loss motivated Watford the rest of his high school career. And no one could knock it off as the Spartans won the next three titles. “You never think you’ll win three state championships,” Watford said. “There are a lot of players who have come through this state and didn’t win one, such as DeMarcus Cousins (now of the Golden State Warriors) and Eric Bledsoe (now of the Milwaukee Bucks). Mountain Brook coach Bucky McMillan certainly puts Watford in that category. “I’ve coached Trendon since he was 5 years old,” McMillan said. “He’s so deserving of the accolades he gets. Watford had arguably the best game of his senior season against the best team the Spartans faced, IMG Academy from Bradenton, Florida. The game was played in December in the City of Palms Classic in Ft. Myers, Florida. Watford scored 38 points, including 26 in the second half, and grabbed 12 rebounds to lead the Spartans to a 72-67 victory over IMG, which was ranked No. 2 in the nation at the time. It was the only loss of the season for IMG (28-1). Watford finished his career with 3,567 points, ranking among the top 10 in AHSAA history, and set a new AHSAA career record with 1,888 career rebounds. Last Friday, Watford scored 13 points and added 12 rebounds, two assists and two steals as Alabama’s Boys All-Stars rallied to beat Mississippi 107-90 in the 29th annual Alabama-Mississippi All-Star basketball series at Alabama State University’s Dunn-Oliver Acadome. Watford also will play in the Jordan Brand Classic April 20 at T-Mobile Arena in Las Vegas. “I’ll be able to hang around Michael Jordan and that makes it 1,000 times better,” he said. Watford remains undecided about where he will play at the next level. He has narrowed his list of colleges to Memphis, Duke, Alabama, LSU and Indiana. His older brother Christian, who played at Indiana, hasn’t tried to influence him about playing for the Hoosiers. “He wants what’s best for me,” Watford said. Watford could be a one-and-done in college and jump to the NBA after his freshman year.